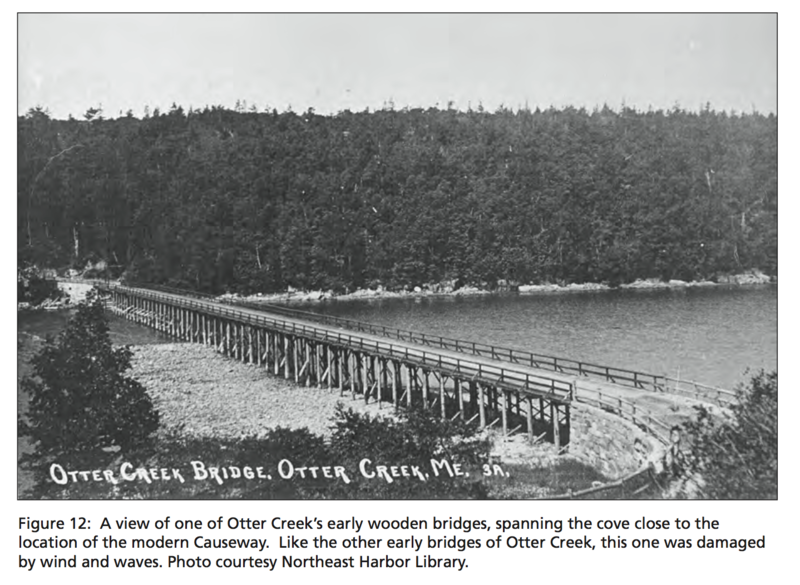 Prologue: I’m afraid we’re dodging back and forth in time on the blog now – I walked the Otter Creek shore in May, interviewed the Park’s Cultural Resource Manager in early July, and am writing this post at the end of July. I’m heading into territory that is less familiar to me, so there’s more and more history that’s completely new to me. I’ve been struggling with the amount of information I’ve received, trying to decide what’s relevant to this project and how to present it coherently. It’s like trying to write a term paper for every walk! In a long-term project like this, there’s always the danger that ‘real life’ will interfere and the project will fade away under pressure. I’m determined not to give up, but I’ll admit that it has been hard to concentrate, and harder still to give writing the top priority. If When I make it all the way around the island, it will be a triumph of sheer stubbornness over inconvenience and distraction. 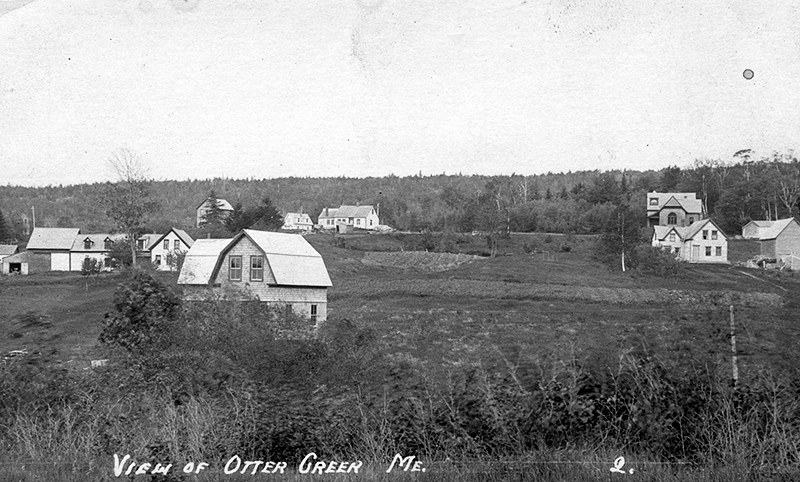 There didn’t seem to be much information on the town at the local historical society; the village of Otter Creek is officially split between the towns of Bar Harbor and Mount Desert, so it seems to fall into the cracks. (It could also be that I haven’t adequately explored the historical societies.) 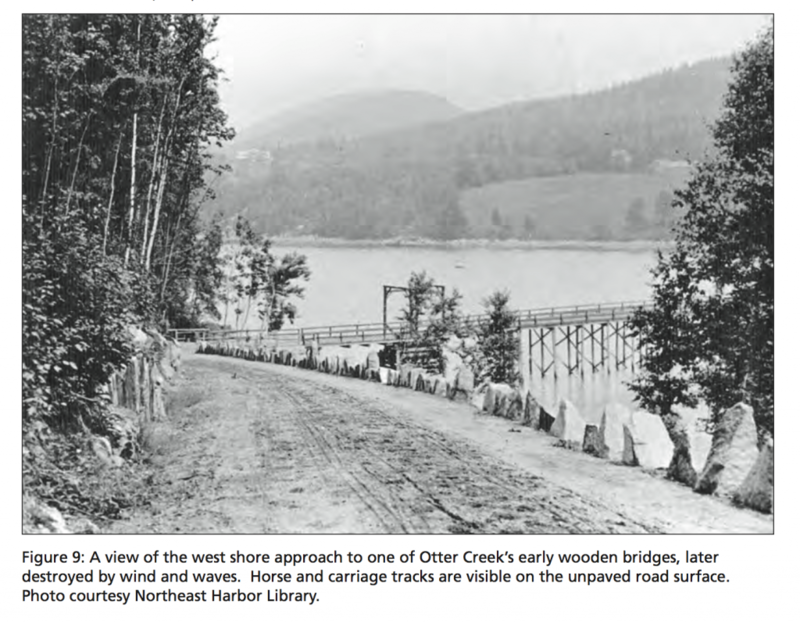 Eventually someone pointed me toward The Waterfront of Otter Creek: A Community History, by Dr. Douglas Deur (2012), a 244-page ethnographic report commissioned by the National Park Service. It’s absolutely fascinating, packed with stories and photos, and I highly recommend it, especially as I just don’t have space to get into a lot of the town’s history here, like why it is so oddly divided and the effect that has had on its social and geographical development. The whole thing is online and downloadable, just click on the title. Second, the cove is exposed to the prevailing storm winds, so boats, docks, piers, and other wooden structures were regularly destroyed by storm surges. A number of bridges pre-dated the existing (stone and earth) causeway; all were washed out during storms. Third, the shore is very steep, making access difficult. 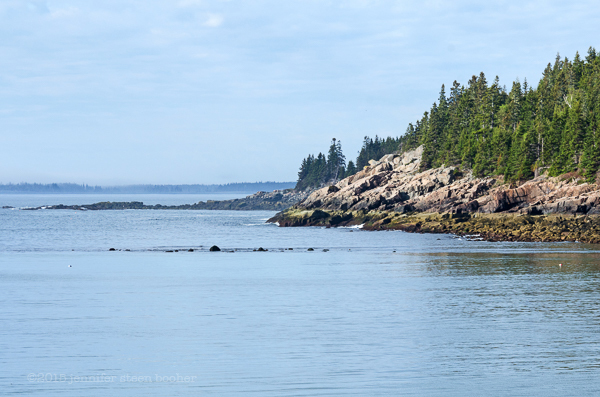 Many fishermen had fish shacks along the shore of the outer cove, which gave them a place to beach their boats, store bait, mend traps, and so forth, without hauling gear up and down the steep hill to town. (More about the fish houses later.) All of which explains why the town stayed small and the shore minimally developed. It sounds like a tough place to make a living from the sea. Photo courtesy of Cynthia Lawry. 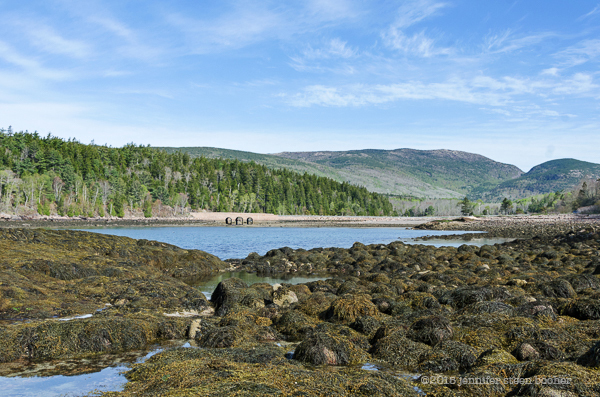 As to what happened to the town’s waterfront, it appears to have fallen to a conjunction of two early-20th-century phenomena: The Great Depression and John D. Rockefeller, Jr. Rockefeller had a vision for Acadia National Park and as we saw over at the Fabbri Memorial, it was a vision of wilderness. 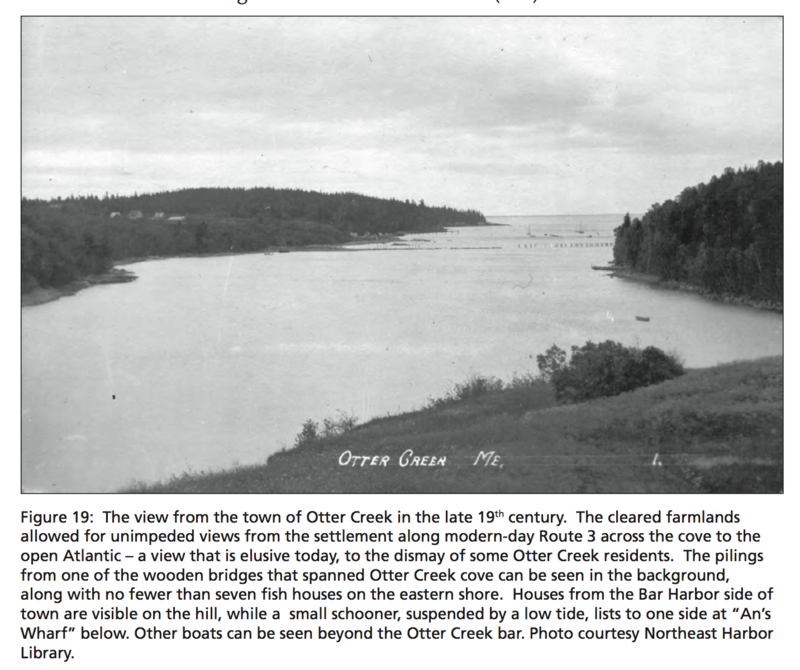 As the farmers and fishermen of Otter Creek felt the increasing pinch of the Depression, he slowly bought up the waterfront land of Otter Creek, removing the structures and allowing the shore to naturalize. [He also imagined an enormous salt water swimming pool in the inner cove, but nothing seems to have been done on that project.] 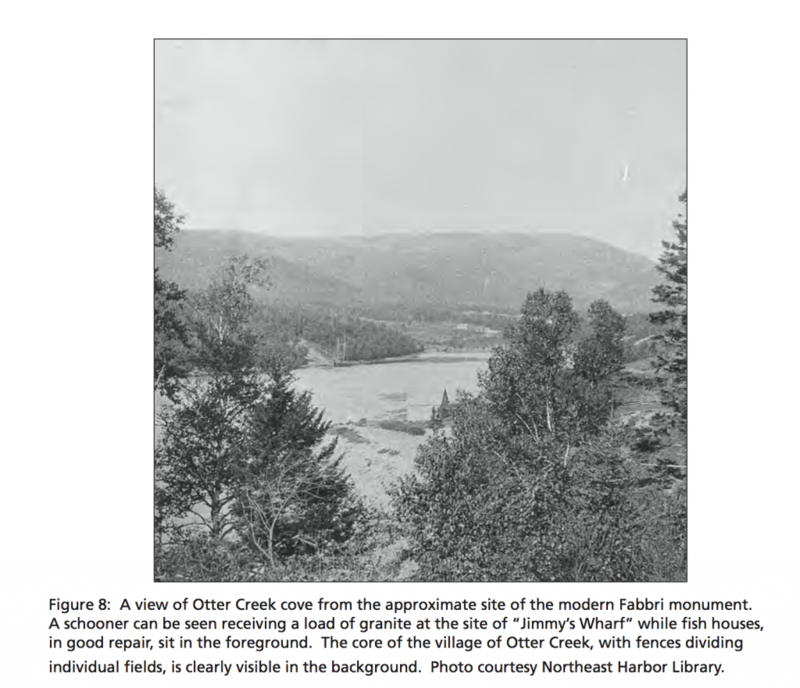 According to Dr. Deur’s research, there were oral agreements with the fishermen that allowed them to continue using the fish houses in the outer cove, but once Rockefeller deeded the land over to the park, there was no record of those agreements. 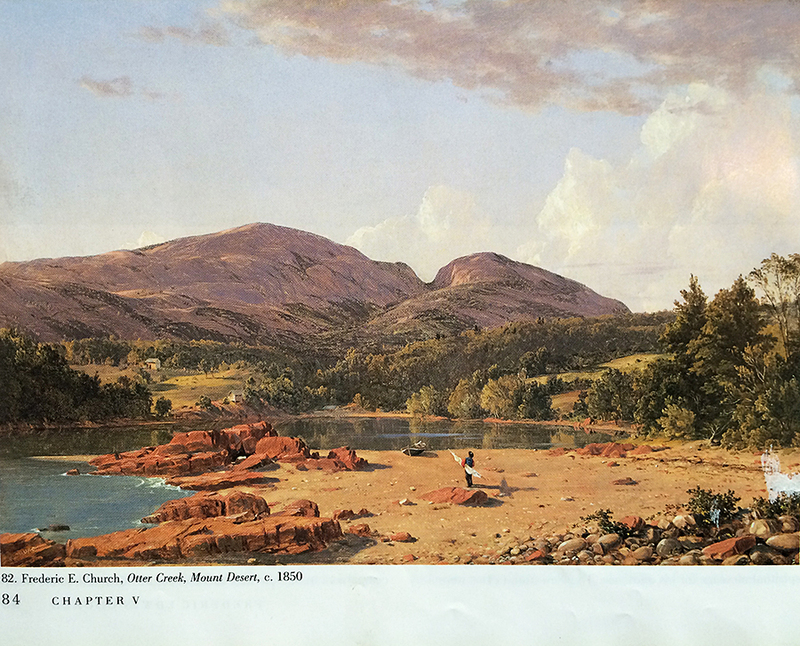 Since the fish houses were rough, messy, utilitarian structures, and the park’s mandate was to preserve the natural appearance of the landscape, this led to years of conflict between the fishermen and the park. 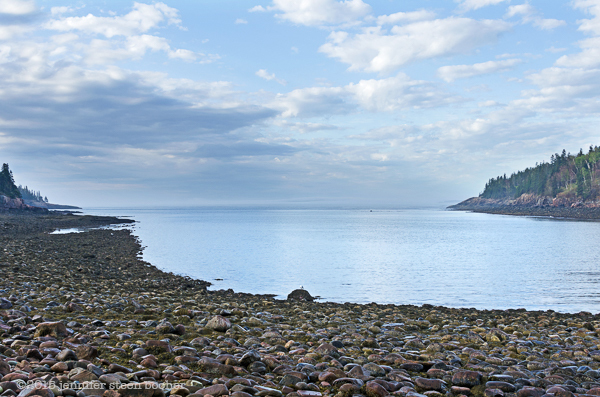 The commissioning of Dr. Deur’s report appeared to me to be the Park’s response to flare-ups of that conflict in the 1990s, so I went to see Rebecca Cole-Will, Cultural Resources Program Manager for Acadia National Park to see what the park’s current thinking is on cultural vs. natural resources. Becky: Well it has some management issues that are … not unusual … where history and traditional connections have kind of cross cut with traditional management of natural resource issues in the park, yes. 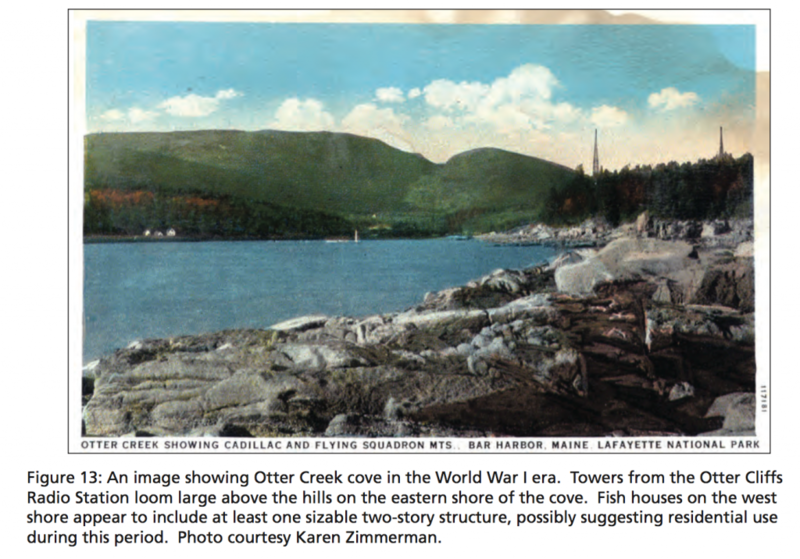 I don’t know if you read Doug Deur’s report on Otter Creek? J: Yes. Did you feel like that was a useful report for the Park? B: Oh, absolutely! It was sort of documented recognition of traditional associations of the place that we weren’t aware of. 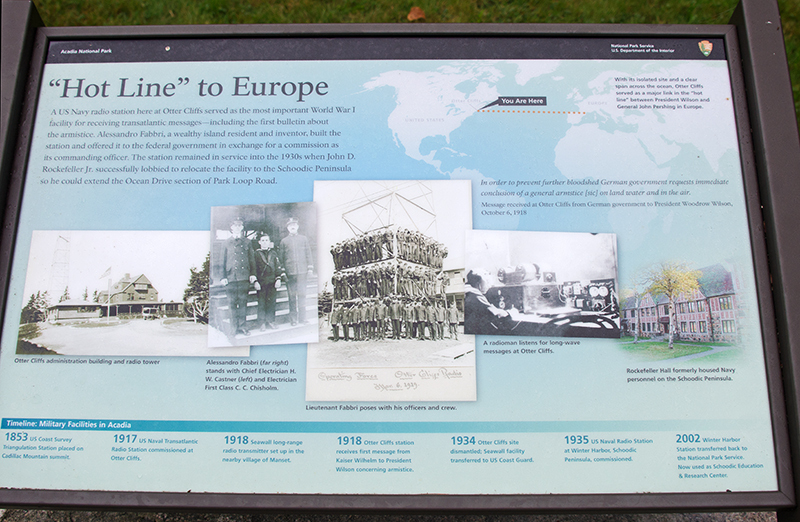 That this was a place that has long, long connections … There are many of those places in the park; we oftentimes don’t get the opportunity to talk to the right people to give us that sort of context for the history of place. So it was, you know, as an anthropologist myself, it was sort of a ‘duh’ moment: well of course this place has really strong ties, and it’s unusual because of the history of the way the Park was created and encircled Otter Creek … I think the report [gave] us the opportunity to really understand how decisions about park management in the past hadn’t necessarily incorporated that local voice, and so gave us the chance to think about ways to re-set that relationship, to go out and actively engage with community. Which is … what parks should do anyway, but sometimes its easy to get busy with the day-to-day stuff and not do as much of that public communication outreach. J: Well, what I originally wanted to talk to you about, even before I found out all about Otter Creek, was, I wondered how you choose, how you define resources and how you choose how to make them accessible and how to interpret them. One other place that I noticed was the Fabbri Memorial, where, you know, I can understand what was going on back in the 30s, I mean, military complex, why not erase it and naturalize the landscape? Which makes perfect sense except now, 70 years later or whatever, we’re all curious about what was there, now that it’s all gone and nobody knows about it. So how do you choose what’s important? J: …I [did an internship] with Charles Birnbaum twenty years ago when he was getting the Cultural Landscape Inventory started. Do you feel like cultural landscape is becoming more integral to the Park Service, or is that still kind of nebulous? B: No, I don’t think it’s nebulous at all. I think that if anything it is becoming more of the notion that really all parks are cultural landscapes. They are created places that were created totally based on cultural values. That’s what a cultural landscape is. B: The minute you set it aside, and you identify it as being something different or something special, you’ve already created a cultural context and it’s a created place; parks are managed for those created values, and also to provide for that visitor experience…, whether it’s wilderness values, or it’s opportunities for solitude, or the kind of recreational experiences we have at Acadia, but they’re all created situations and contexts. … Even in the places that are managed for wilderness … they’re places that have human value and human connection and the very concept of wilderness is very much a cultural value. There’s nothing ‘real’ about wilderness, it’s what we think it is. [There’s] the bigger level of the … interconnectedness of all of the resources and the values for which we have to manage a park. Every day you have to make decisions based on how … managing for this visitor experience [is] going to affect a resource, how is protecting this resource going to impact infrastructure, how do we interconnect and balance all of those; and every day we have to make some of those value judgements, again, guided by law and policy and what we understand for baseline documentation of the resources. So we spend a lot of time in resource management doing things like base-line inventories, monitoring air quality, water quality, monitoring for visitor impacts to resources, going out and asking visitors ‘what kind of experience did you have, what kind of an experience are you looking for?’ And then bringing all those pieces of data together … to shine a light on the decision-making process. We make decisions based on what we know, we don’t make decisions that are arbitrary or not grounded in good planning; there’s a lot of legislation and law that we bring to the planning process. Things like … the National Environmental Protection Act, which mandates that we protect the natural environment but also the human environment as well. And NEPA’s really a policy for planning. In terms of guiding good decision-making, and being able to justify what kind of decisions we make for major undertakings, and then the counterbalance to NEPA is the National Historic Preservation Act, which is another law that requires us to look at the impact of our undertakings on cultural resources or historic properties, and list properties to the National Register of Historic Places, and when we do work on them that we do it within the guidelines of rehabilitation, for example. So those are two … big pillars for planning, for understanding, and then the third one would be impacts and understandings about our visitors, because after all, we’re … providing for a high-quality visitor experience as well. … I think it always comes back to we earnestly try to make good decisions based on the information at hand, and so we have a thorough process of vetting … that does require public engagement. We need to go out and talk to people, find out what they’re thinking. J: I’ve been working on this project since January, and it just happened to coincide that as the weather warmed up I got into the more public areas of the park. I think I hit Great Head in May, and so I started to see more and more people. I was alone for months! And I’ve seen people rock-climbing, people hiking, high-schoolers goofing off on the beach, I stumbled across a wedding, and I’ve been down there now with a COA professor doing scientific assessement of tidepools, and I was just blown away at how the heck do you manage all this; and that was just from Great Head to Otter Cliffs. How do you manage that kind of pressure, like balancing the wedding party with the rock climbers? That’s a hell of a job you’ve got! B: Yeah, it sure is! It’s not easy. Again, … providing for the public to be able to do the things they want to in a park without necessarily either impinging on someone else’s experience or not being safe or damaging resources is a very delicate balancing act. And it’s tough. With something like those two events, they’re both regulated. Sometimes people get really frustrated with the amount of regulation that we require, but that wedding requires a special use permit, the rock-climbing, there’s a whole climbing-management plan in the Park and those climbers require a permit…, so it is tough, it’s very complicated, and I think people don’t realize that it’s like running a city when you try to run a park, and with a fairly small staff. The folks that are out there every day, the rangers and the interpreters and the visitor-use people really do a fantastic job. J: And then I came across the Fabbri archaeological report and the Otter Creek report, and by the time read the two of those my head was just spinning. It’s a lot of history! B: There’s a lot of layers of history in this small space. We forget how small and for how long and how many layers there are. It’s a real palimpsest. J: I just wondered, going forward, do you have plans to work with those documents, or are you ready to talk about that yet? J: Do you have any plans based on the information? B: Well at Otter Creek a big thing that we’re doing is we’ve really tried to re-engage with that community, to have meetings to try to understand; unfortunately the past is, and we can’t bring back the fish shacks, and we can’t, probably we won’t be removing the Otter Creek causeway, but are there opportunities for recognizing and providing for ongoing access into the Creek for the community, and those are some of the things we’re certainly trying to work on. Also just recognizing that that history exists; for example, last summer one of the interpretive programs at Blackwoods was about the history of Otter Creek. We’d never done that before. We could talk about this long history of the connection of this community to this place, and provide for that place-based understanding and experience for visitors that we never did in the past, so hopefully there’s that level of at least appreciating that history does exist even if it’s not necessarily visible on the landscape any more. So those are the kinds of things that we can do. There’s a new wayside that’s up at Fabbri …, maybe it hasn’t been installed yet, but it would be one of the outdoor display exhibits – if you’re at the memorial, then there’s this parking lot that looks out over the cove. 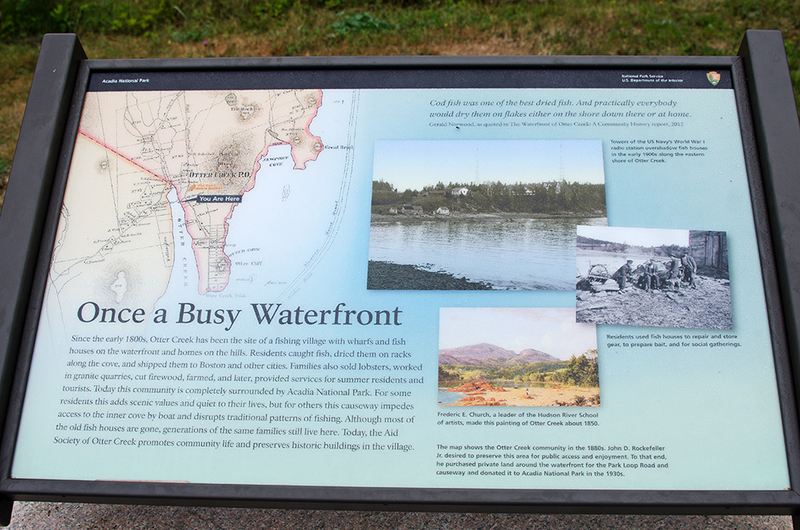 … When you’re standing there you’ll be looking out towards the causeway and the Creek … and there’s information on that that talks about the history. B: So it might not have been installed yet. J: I’ll have to go back. B: So that’s at least one thing. J: Yeah but that’s a big thing. It’s amazing the difference something as simple as a sign showing ‘what was’ compared to ‘waht is’ – that can be really valuable. B: And there’s a trail that goes from Blackwoods, I don’t know if you’ve hiked the old quarry road? J: I haven’t. I’ve heard it’s fantastic. B: It’s a very nice trail, and that goes from Blackwoods around and eventually gets to the causeway, and it goes along the old Quarry Road, and we kept that name intentionally because … folks from Otter Creek said, ‘Let’s call it that;’ that’s what the history’s about. So that’s another opportunity. I know that some of the rangers do a hike that interprets the area. So there are things like that that we can do to recognize that there are those real deep layers of history and its all very much interplayed there. J: As I continue hiking are there other sort of hotspots like this that I should look out for? B: I’m trying to think where you’re going to be going next. 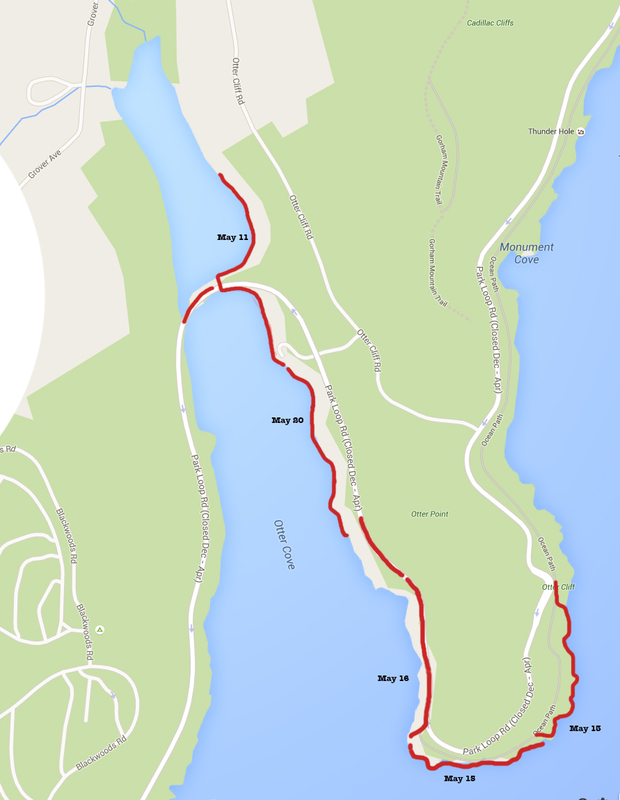 J: Well I’ve physically hiked as far as Hunters Beach, but in the blog I’m only up to Otter Creek. It takes a long time write these posts! B: Yeah! … You know Stanley Brook is really kind of interesting because the road’s part of the historic motor road there, and … if you walk and look at Stanley Brook you’ll see all kinds of little features, little waterfalls and eddies and so on, and that’s a wholly reconstructed waterway there. 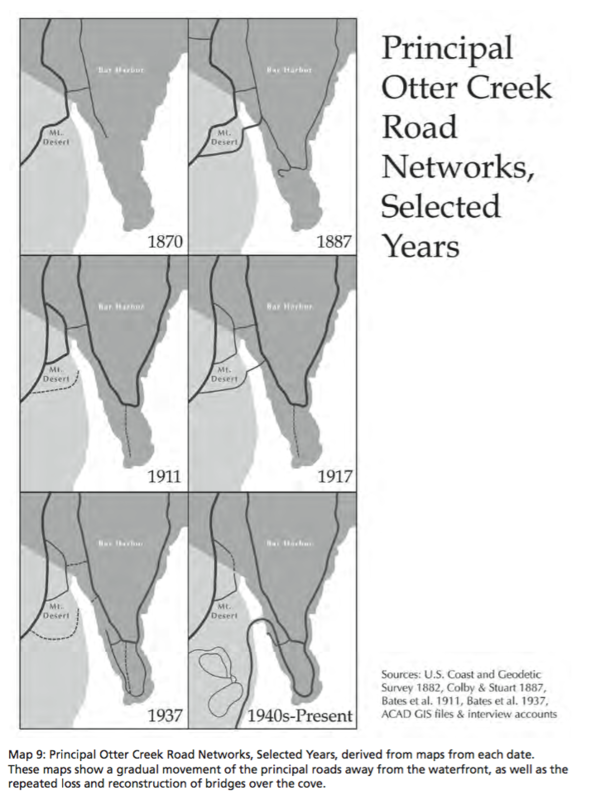 It was probably built when Rockefeller with his engineers planned that road, they basically re-routed a lot of the stream so the road goes back and forth across it with the little bridges and so on. That’s a fundamentally altered landscape there. J: That’s a different way to look at it. Do you know if Beatrix Farrand had anything to do with that? B: She did, a little bit. 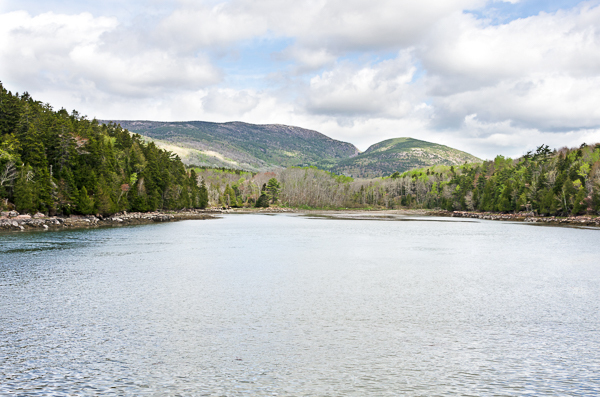 If you go to the bridge, the carriage road bridge that crosses over Stanley Brook, that’s one of the most iconic bridges, it’s got the two side arches and then the center and the stream flows through one of them, you’ll see that you can still see remnants of her designed landscape there. There are some ash trees that are on either side of the bridge, and there’s a little bit left of that designed landscape from a long time ago there. So that’s a very cool place. J: I’ll have to take a closer look. I’ve never actually walked through there, I’ve biked. The reason I asked about the stream is because at Dumbarton Oaks, are you familiar with it? J: There’s the Dumbarton Oaks Park, which is no longer really part of the managed landscape, althoughI shouldn’t say that, I was involved with this like 20 years ago so, but she had actually designed that stream, like where she had designed the waterfalls, she’d tuned them to a certain pitch, and I was wondering if she’d done something similar here. B: Well I don’t know if she was involved with the design work for the stream or not. We don’t have a lot of records, most of it is anecdotal where supposedly she rode around with Rockefeller and said ‘Oh we should put a tree there,’ without having a lot of formal designs for her work. The person to ask would be Scott Koniecko. He’s the president of the Beatrix Farrand Society, Garland Farm. …What designed drawings exist for her work are all at Berkeley, and [Scott’s] gone and looked at them, so when I have a question about Farrand, I usually ask Scott. He can often answer that. J: Alright, I’ll see what he can tell me! B: But that’s an interesting question. It’s definitely a designed landscape, that entire stream, even though the average person wouldn’t recognize that as they’re driving up Stanley Brook Road, because it’s small and winding. J: Well I’m glad you told me, I’ll definitely detour up when I hit the beach there. And are there any other hot spots? I’m walking the whole island, so eventually I will get everywhere. On the coast that is. J: Yeah, it’s going to take so long. B: I think one of the most amazing places is Wonderland. Without a doubt. I don’t know a lot about the history there but I understand it was either a little zoo or some kind of entertainment – it was called Wonderland for that reason – but if you go there now you’ll see that it’s one of the most amazing natural vegetation zones; it’s a globally rare community that includes the pitch pines and the broom crowberry there together, and it’s really amazing. B: Wonderland is worth a visit for the vegetation there. We had a crew that, well there was a team of dendroecologists that did some dendro work coring trees in the park just within the last month, and there are 300 year old pitch pines at Wonderland. They’re just tiny, tiny, little trees, because they’re kind of like these bonsai… The inventory and monitoring network folks have done a wonderful briefing that talks about management decisions for protecting Wonderland based on an understanding of the globally rare nature of the vegetation there. J: I’ve been really impressed at how much is online. 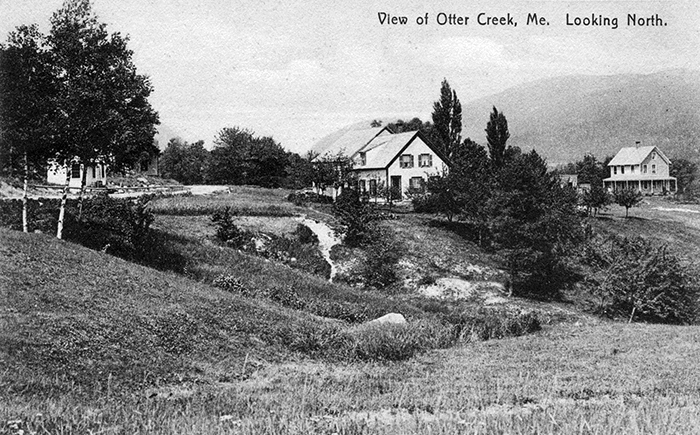 I mean I found both the Otter Creek and the Fabbri archaeological, all of that I found online. B: You know about IRMA? B: IRMA stands for the Integrated Resouce Management Application. If you search on that there’s a lot of digital records of all kinds of stuff related to the Park. I went back to the Fabbri picnic area to see the new wayfinding signs. Nice!